The heavily wooded Ozarks comprise some 47,000 square miles, spanning parts of Missouri, Arkansas, Oklahoma, and a small corner of Kansas. 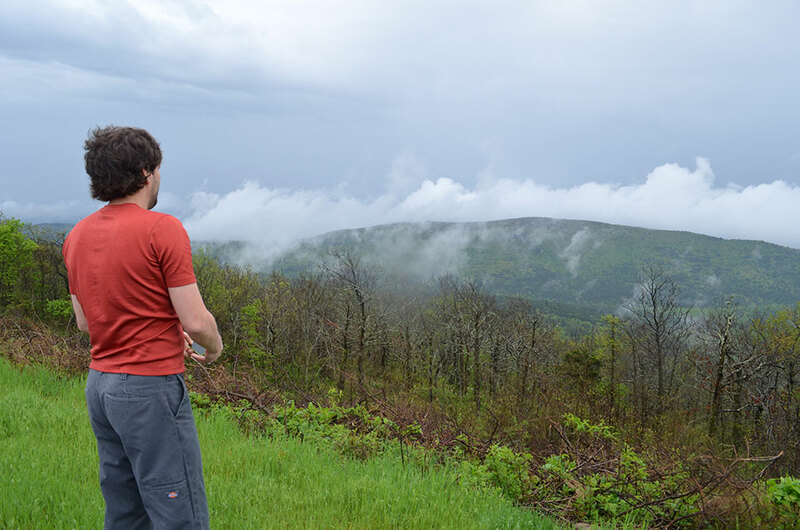 Tree-ring scientist Neil Pederson takes in an early-spring morning view in Arkansas’ Ouachita National Forest. Fertile, well-watered floodplains along creeks support some especially valuable trees such as black walnut and red oak. 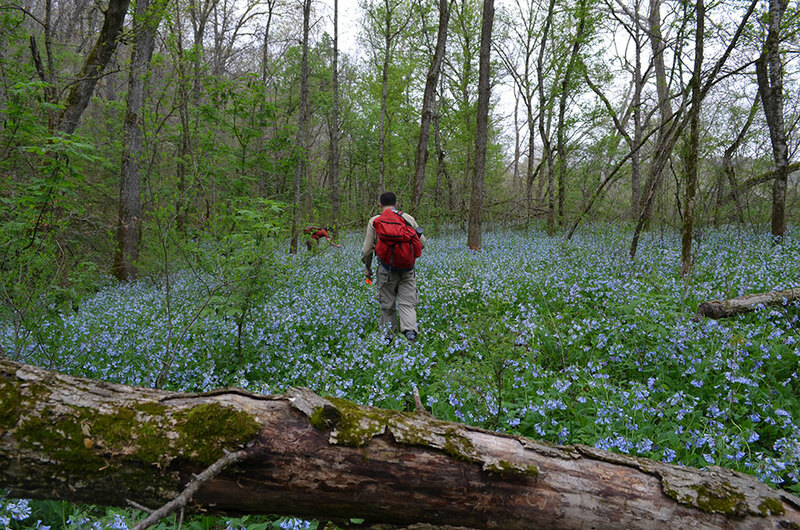 This site in southern Missouri’s Peter A. Eck Conservation Area was a considerable hike beyond the end of long dirt road. 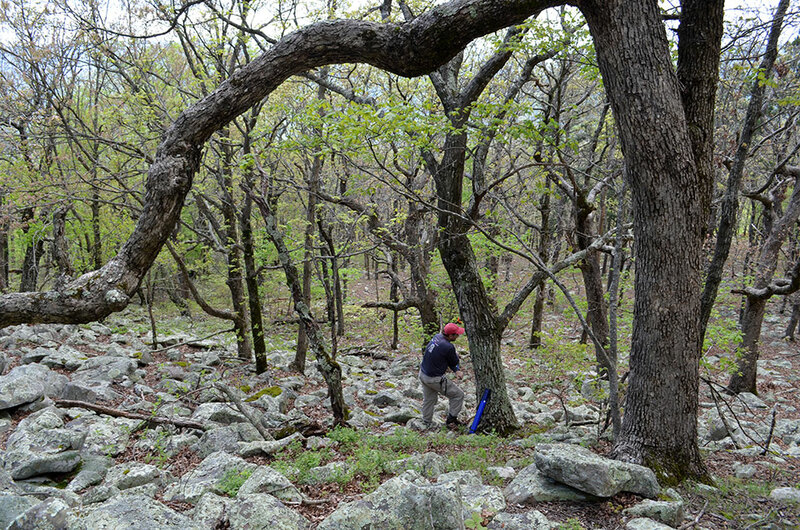 Drier upland sites like this one in western Arkansas host different communities, including the oaks that predominate here. Rocky terrain like this is also a great place to encounter rattlesnakes. A key to tree vigor is moisture, and moisture is often controlled by temperature—generally hotter means less. 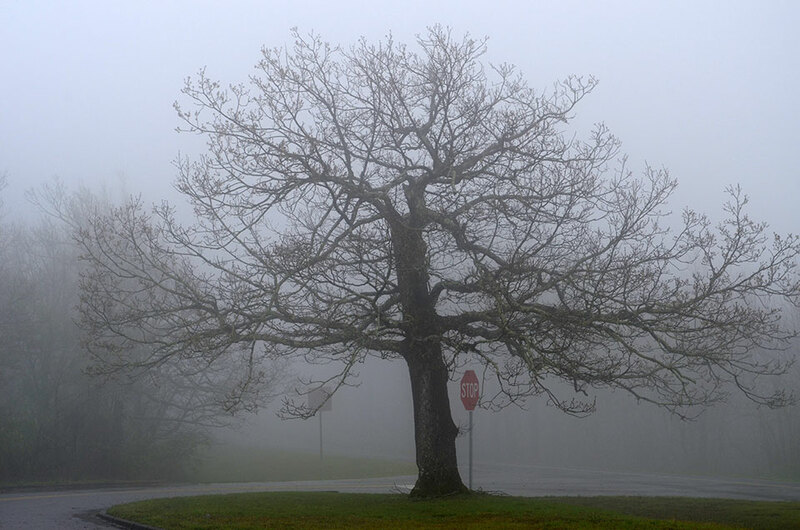 Atop a high ridge straddling the Arkansas-Oklahoma border, an old oak looms from morning fog. 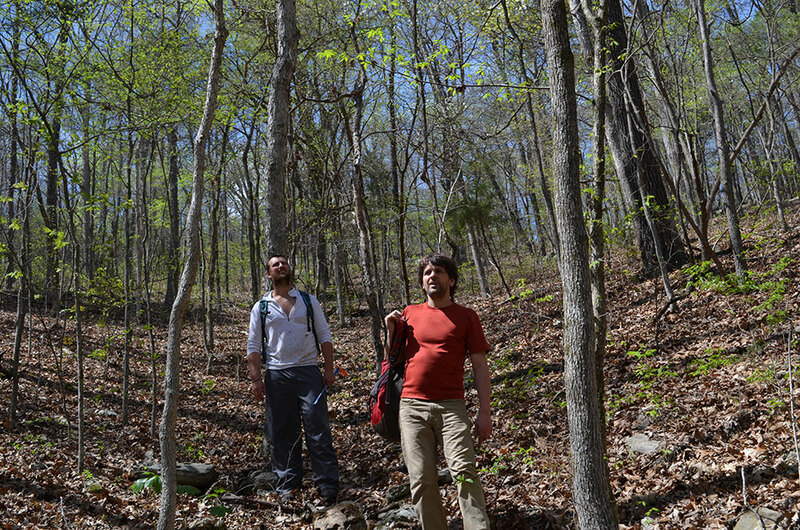 In the woods of southern Missouri, Pederson and Lamont bioclimatologist Park Williams (left) explore for big old trees. At one point they hear the cry of a pileated woodpecker—a sign they are on the right track. 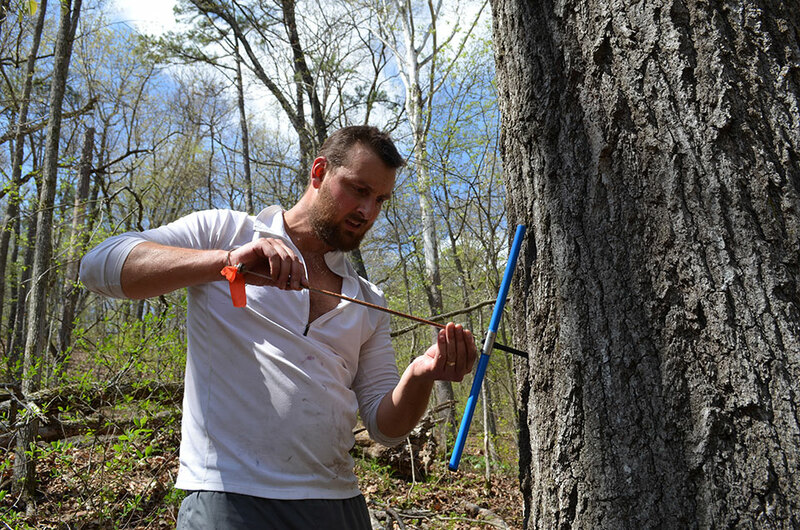 Williams and the others set to work extracting tree rings, by which they can gauge how various species have reacted to past swings in precipitation and temperature. The basic tool is an increment borer—a hollow bit screwed into the trunk that harmlessly samples a straw-size cross section. 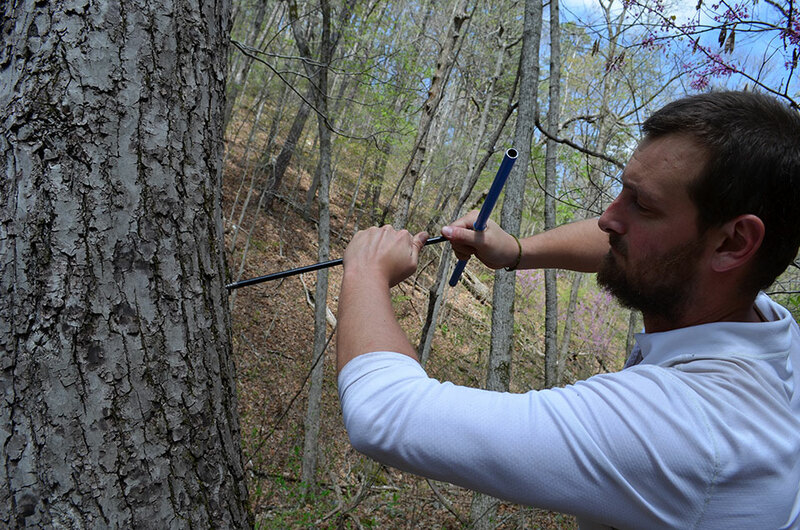 Coring a tree takes muscle and persistence. The team does dozens of them a day. 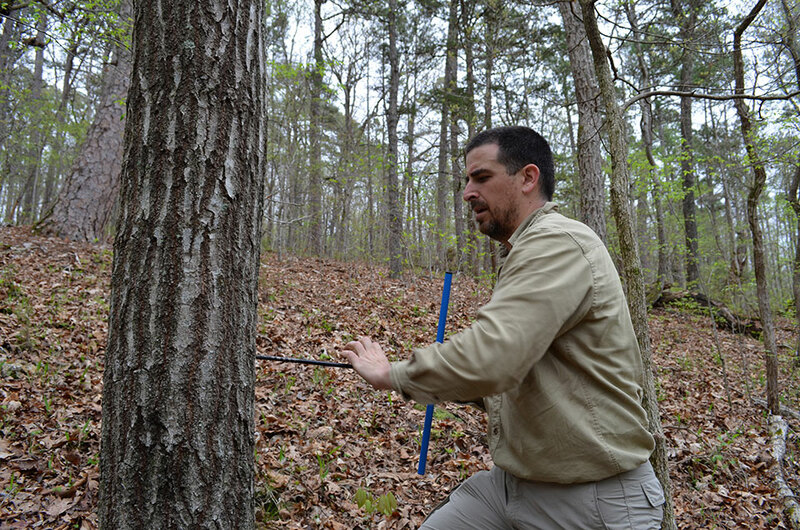 Here, Lamont Tree Ring Lab technician Javier Martin Fernandez works on a red oak. Williams extracts a core from a massive red oak. Specimens up to 400 years old can be found in isolated spots, but it is the last 80-some years the scientists are mainly after. 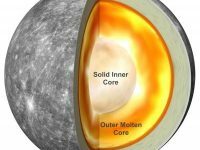 Those are the years covered by modern instrumental record, and the rings can be closely correlated with those to paint a picture of how trees have fared under known conditions year to year. 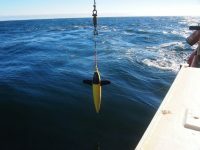 This will allow the team to project how they are likely to react under future scenarios. Different species have different ways of coping with changing weather; if the climate heats up as expected, some may do better in the long term, while others will do worse. 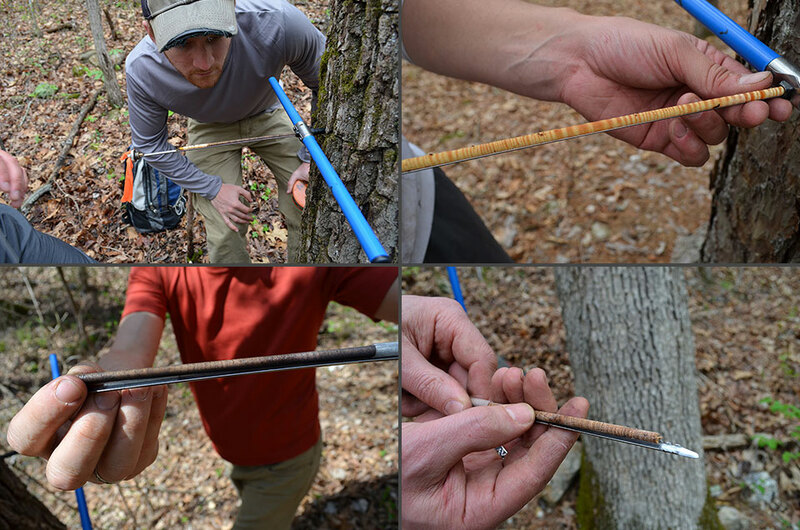 Clockwise from upper left: Harvard Forest technician Daniel Bishop inspects a fresh core; a shortleaf pine core shows characteristic thick rings of this fast-growing timber species; a sample of slower-growing white oak; fragrant black walnut, a slow-growing, long-lived tree that can reach behemoth size and become fantastically valuable. 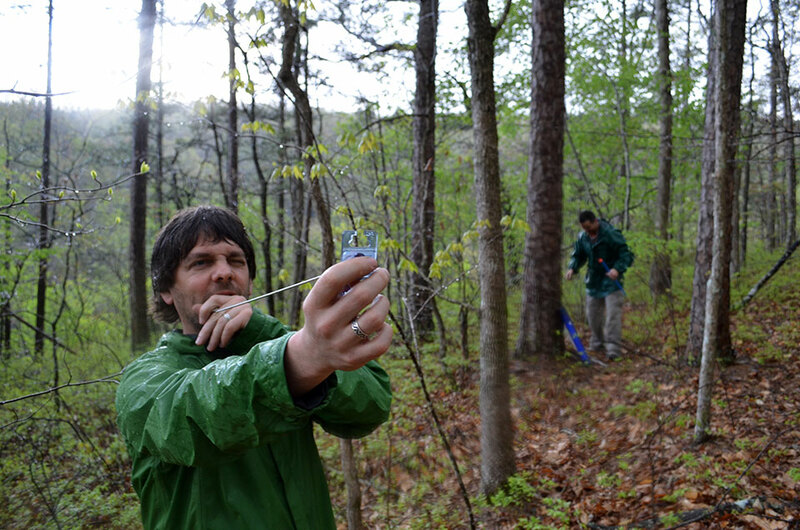 In a soaking rain, Pederson eyeballs a plot through an angle gauge, a forester’s tool for estimating forest density and species composition. The bottom line: Fresh-cut shortleaf pines await their turn to be turned into lumber at a small-town sawmill in northwestern Arkansas. 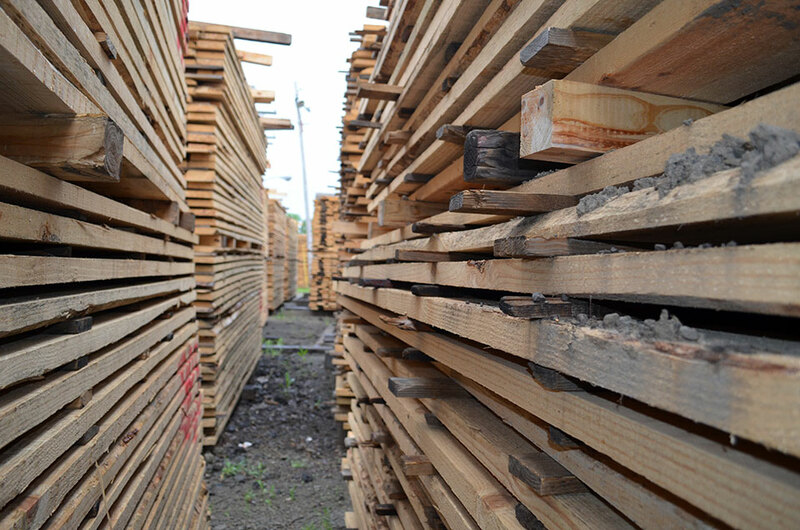 Logging for lumber and paper has long been a mainstay in this region, but the industry could be threatened if major species don’t do well in a hotter climate. Former pines, now two-by-sixes, sit roadside, ready to go. 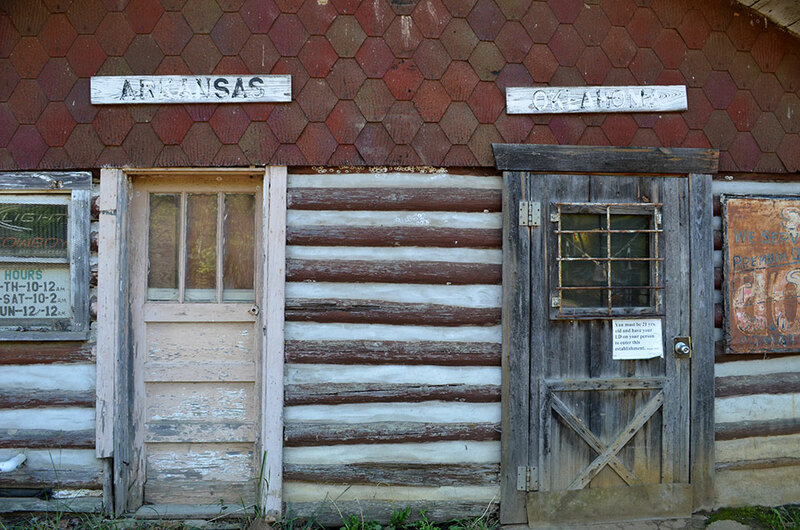 On a back road, a rural nightspot built of local logs straddles the state line so neatly, you can enter in one state and leave in another (in more ways than one). As you travel westward from Arkansas into Oklahoma, the land flattens, climate dries, and trees become less common. 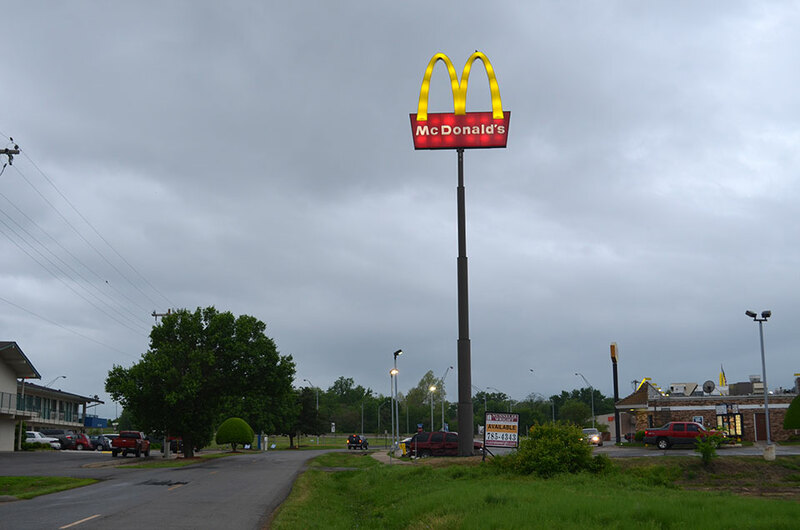 A new type of tree sprouts near a motel outside Fort Smith, Arkansas, where the team has just spent the night. 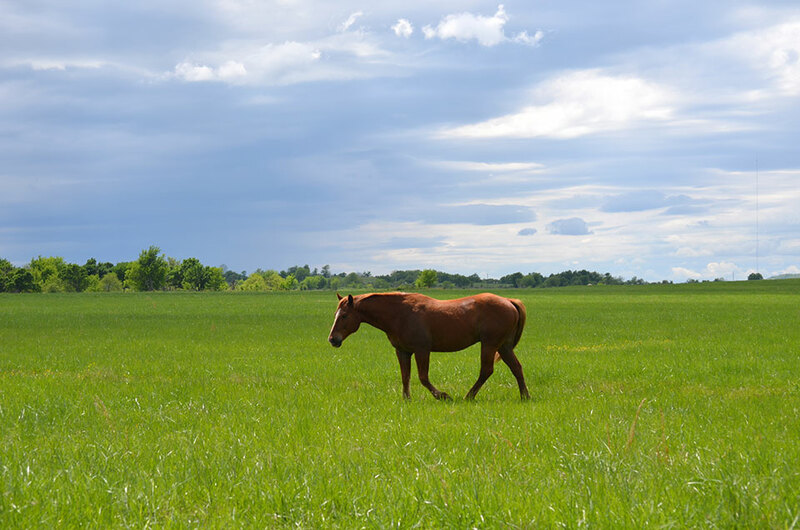 Urban sprawl is overtaking many once rural areas. Not far into Oklahoma, grasslands soon take over. This kind of landscape could start creeping eastward if the region gets too hot and dry for most trees to thrive. 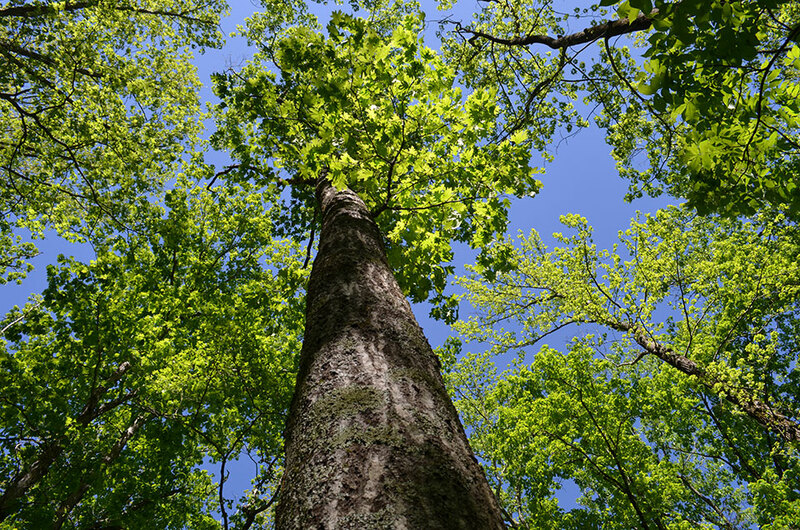 Trees like this red oak are not just affected by climate; they affect the climate themselves, by storing huge amounts of globe-warming carbon that otherwise would end up in the air. 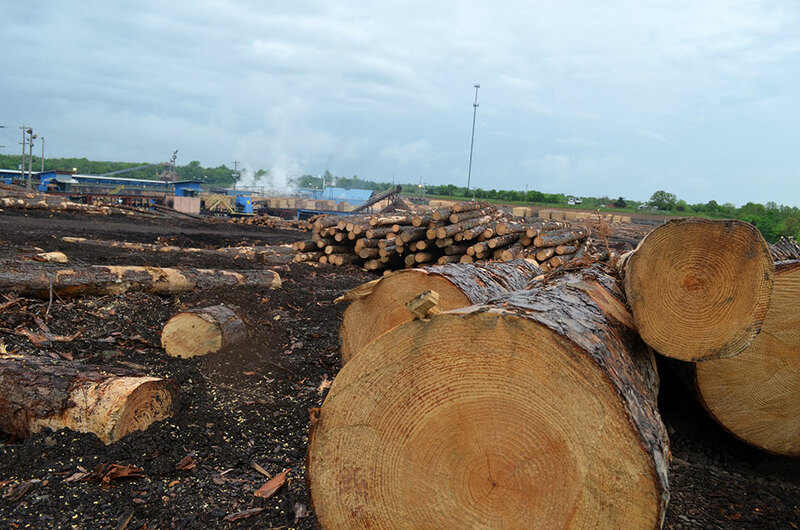 The future carbon-storage capacity of the region’s forests is a question mark. Forest floors support complex ecosystems that would undergo changes if tree species were to shift. 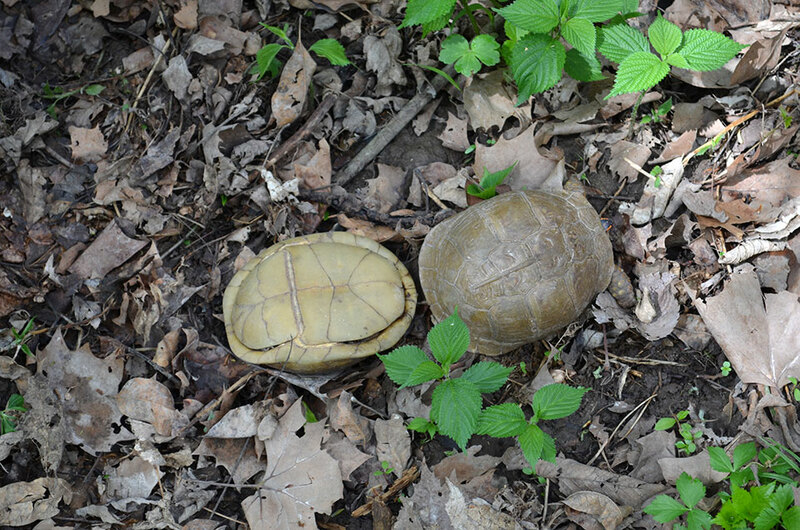 Turtles do well in one moist southern Missouri tract. In a sign of vulnerability, this section of pines was wiped out by wildfire, following a recent short but intense drought. 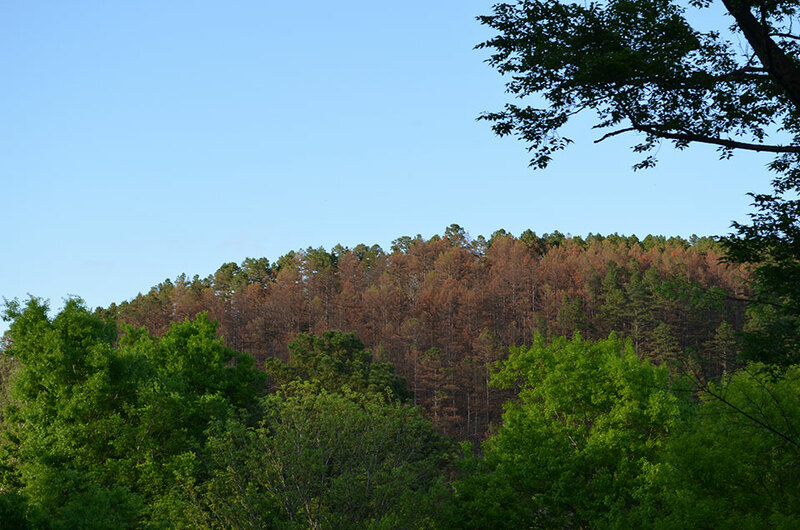 Another threat is insects: Pine-bark beetles thrive in warm, dry conditions, and have already wiped out vast forests in parts of the western United States where persistent warming and drying have taken hold. Scientists are not immune to natural beauty. 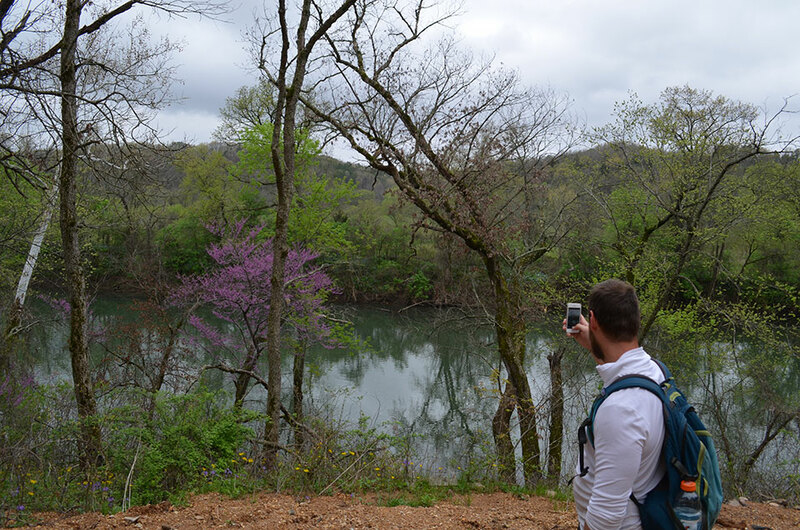 Williams captures an image of a redbud in full bloom to send home—as soon as he can get out of the woods and near a town that has a cell signal.